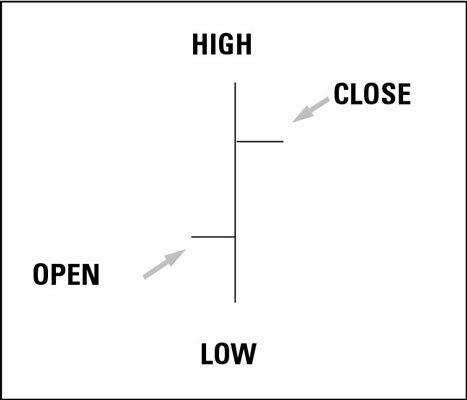 In technical analysis, the price bar describes and defines the trading action in a security for a given period. Trading action means all the real-money transactions conducted during the period. The price bar measures actual deals done with cold, hard cash, not what somebody wished, imagined, or contemplated. A price bar can encompass different periods — anything from a minute to a month. But the scope of the period doesn’t change the price bar dynamics. Open: The little horizontal line on the left is the opening price. Close: The little horizontal line on the right is the closing price. This Open-High-Low-Close component set of the price bar is often abbreviated OHLC. Tick marks: The two little horizontal lines on the price bar. In trading parlance, a tick represents a single trade at a single price, so the tick mark representing the open or the close refers literally to a single transaction or to a batch of transactions all at the same price and at the same time. The high and the low don’t need a tick mark because the end of the bar conveys that information. The single bar: Each vertical bar reflects a very real contest — and you measure the outcome in money. If the bar is very tall, encompassing a $10 range when the normal bar for this security is only $3, the trading was a Titanic battle. If the bar is very short, say $1, it was a pillow fight. On every single trade, one party wins and the other party loses. That is why trading — like war — is called a zero sum game. The relationship between prices and volume is important in judging the bar. Volume is the number of shares or contracts traded during the period that your bar encompasses. Everything that you infer about the state of mind of the market participants is subject to confirmation by volume. For example, if the price bar is three times the usual size, you would want to verify that a large number of traders were active that day by looking at volume. It would be wrong to see a trading battle if only one trade was done at the $10 high. In that case, the $10 price is an anomaly. Somebody made a mistake — either the buyer at $10 or the data collection department at the exchange. When you get befuddled by a tangle of patterns and indicators on your chart, return to the basics — a clean chart that contains only the price bars — and ask yourself “What are these bars saying?” Price bars are the raw material of indicators, so when indicators are giving you conflicting or confusing signals, go back to the source.